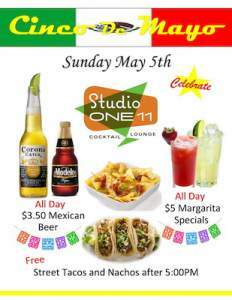 Join us at Studio One 11 for Cinco de Mayo. Mexican beer will be just $3.50 and we’ll have a selection of Margaritas on special for $5 each. Free nachos and tacos served after 5pm!